Aged ten, Jack Luton struggled with self-confidence and had a negative sense of what he was capable of achieving. He came to a Palace for Life Foundation Football for Change session in May 2016 – where children take part in both sports and non-physical activities to work towards positive goals – but struggled to join in fully with the other children, criticising himself and talking himself down. Early in his involvement, Jack showed more of an interest in the non-physical games and did not have the confidence to take part in the football. However, following some encouragement, he slowly became more comfortable in his surroundings and started to participate in the football sessions more often. Jack also recognised the improvements he was making and began to talk more positively about himself. After attending regularly, Jack’s enjoyment and confidence had grown to such an extent that he encouraged his younger brother Ben to come and join him. With the added incentive of having his brother alongside him, Jack had one of the highest rates of attendance at the programme, and Foundation coaches noticed how much both boys were enjoying the sessions. Realising how much he had benefited from the Football for Change sessions, Jack went on to take part in further Foundation events, attending the 2017 summer L&Q activities programme, which involved a range of sports, including football, tennis and rounders, as well as other activities such as arts and crafts, and laser tag. 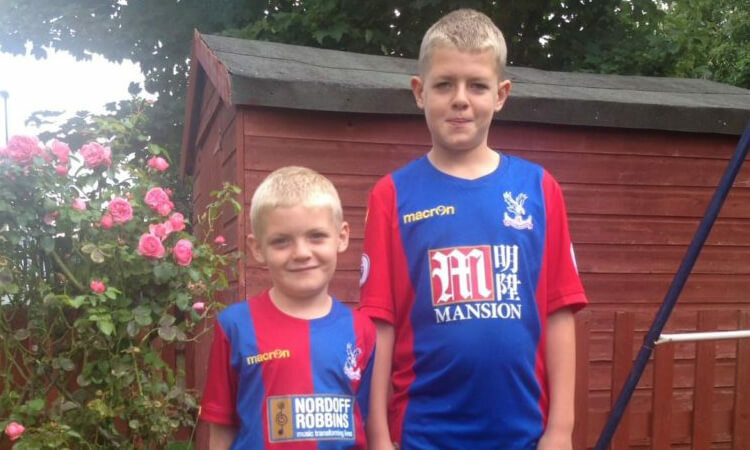 As a reward for his high attendance and the increase in his self-belief, Jack and his family were given four tickets to a Crystal Palace pre-season game at Selhurst Park. They all enjoyed the day, taking over 200 photos to prove it! Jack’s mum, Charlene, said: “Jack has gained some much-needed confidence and self-esteem both on and off the pitch. He also learned some of the rules of football that he didn’t know about and has improved his skills whilst having an enjoyable time. That is all thanks to the activities that Palace for Life have organised and funded. “If it wasn’t for the Foundation putting on programmes both on a Friday at Timebridge and through the holidays, Jack would not have had much to do. We are grateful to the Foundation and its employees for doing this and we cannot thank you enough for what you do.